A cost-saving solution for in-house counsel. We know it’s tough out there. Your legal budget is under more pressure than ever. And, at the same time, so is your need for legal services. The heightened regulatory environment, globalization of your business and increased competition make outside counsel business critical. You’ve considered running RFPs to help contain costs, but you know the process can be time consuming and unwieldy. 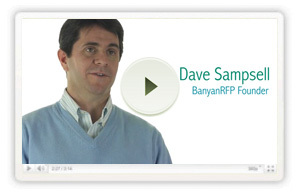 Enter BanyanRFP—a private, secure, cloud-based RFP application that saves you both time and money. BanyanRFP was a great help in driving best pricing when hiring counsel for a litigated matter. Working with BanyanRFP was turnkey--from our initial conversation to having results in hand--the process took about a week. The spread on offers was significant and the detailed data helped us make the most cost effective decision.